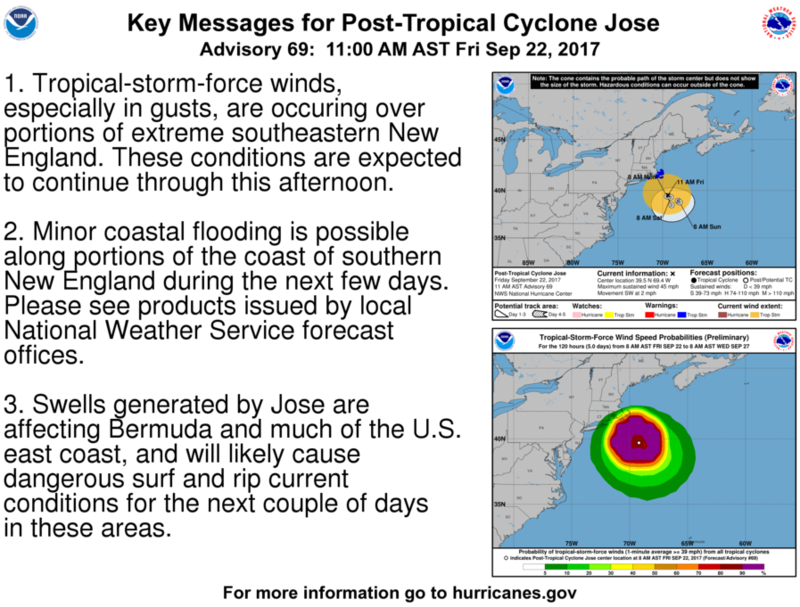 ..Post Tropical Storm Jose Message updated for the NWS Taunton Post Tropical Cyclone Report on Jose with a link provided below. An update to the Jose photo album will likely occur between now and this weekend. This will be the last Post Tropical Storm Jose coordination message unless a significant change to the data occurs.. ..Tropical Storm Jose brought pockets of tree and wire damage, isolated power outages, pockets of coastal flooding and very high surf conditions and heavy rainfall and minor street flooding issues to Southern New England..
..Any photos and videos can be sent as a reply to this email, via the WX1BOX Facebook/Twitter feeds or via the email address pics@nsradio.org and will be added to the WX1BOX Facebook Album and posted on the WX1BOX Facebook/Twitter feeds with credit given to the Amateur Radio Operator/SKYWARN Spotter for the photo/video. ..The following is a compilation of all reports of damage, rainfall etc. as provided by SKYWARN Spotters and Amateur Radio Operators from across the region. This includes the NWS Taunton Local Storm Report, Public Information Statement and Post Tropical Cyclone Jose report, WX1BOX Facebook Album and WX1BOX raw Amateur Radio log.. ..The following is a compilation of all reports of damage, rainfall etc. as provided by SKYWARN Spotters and Amateur Radio Operators from across the region. This includes the NWS Taunton Local Storm Report and Public Information Statement, WX1BOX Facebook Album and WX1BOX raw Amateur Radio log. This coordination message will be updated once more when the NWS Taunton Post Tropical Storm Jose report is issued..
..Hurricane Jose weakens to a tropical storm. Confidence continues in tropical storm impacts to portions of Southern New England similar to that of a nor’easter or strong nor’easter type of storm but more confined to the Cape and Islands with some wind effects farther north and west. Wind effects expected to last through early Thursday Evening.. ..The Tropical Storm Warning from Hull Massachusetts southward to Sagamore Beach and west of Woods Hole has been discontinued meaning the Tropical Storm Warning for Newport and Washington Counties Rhode Island and southern Bristol and Southern and Eastern Plymouth Counties is discontinued..
..A Tropical Storm Warning remains in effect from Sagamore Beach Massachusetts to Woods Hole Massachusetts and includes all of Cape Cod and the Islands including Block Island, for sustained winds of 20-35 MPH with wind gusts in the 45-60 MPH range with isolated higher wind gusts possible and 2-5″ of rain likely. These winds could cause isolated to scattered pockets of tree and wire damage and isolated power outages as well as urban and poor drainage flooding from heavy rainfall along with minor to moderate coastal flooding and the potential for significant beach erosion..
..A Flash Flood Watch remains in effect for Barnstable and Nantucket Counties of Massachusetts from Tuesday Evening through Wednesday Afternoon for 2-5″ of rain with isolated higher amounts..
..A Wind Advisory is now in effect from 1000 AM Wednesday Morning through 6 PM Thursday for all of Rhode Island except Northwest Rhode Island and Essex, Southeast Middlesex, Suffolk, Bristol and Plymouth Counties of Massachusetts for sustained winds of 15-25 MPH with gusts up to 45 MPH and isolated higher wind gusts possible along the coastal areas and at Blue Hill. These winds may cause isolated pockets of tree and wire damage and isolated power outages..
..A Coastal Flood Advisory is now in effect from 11AM to 3PM Wednesday for Eastern Plymouth County for minor coastal flooding of shore roads at the time of high tide Wednesday..
..A High Surf Advisory is now in effect for Eastern Essex, Eastern and Southern Plymouth Counties of Massachusetts and Newport and Washington Counties of Rhode Island through County Massachusetts through 8 AM Friday for southerly swell, high surf and rip currents at area beaches from Tropical Storm Jose. The High Surf Advisory was expanded back into parts of East and South Coastal Massachusetts and Rhode Island due to discontinuing the Tropical Storm Warning for these areas.. ..Tropical Storm Jose will continue to gradually weaken in 1-2 days and become post tropical in about 2 days but has a large storm envelope and it will continue to become a larger system with an expanding rain and wind field and will continue to travel northward-northeastward for the next day or so and then turn toward the northeast south of the 40 North/70 West benchmark Wednesday into Thursday. On this track, the stronger impacts will stay offshore for a time but because Jose is expanding and will expand further when it becomes post tropical. prolonged period of strong wind gusts will continue in the Tropical Storm Warning and Wind Adivsory areas into Thursday..
..VoIP Hurricane Net and Hurricane Watch Net management are monitoring the progress of both Jose and Maria. These hurricane nets are activated for Maria and will remain active through late Wednesday Night for Puerto Rico and the US Virgin Islands and will continue to monitor the progress of Jose. Check out the Hurricane Watch Net web site at http://www.hwn.org and the VoIP Hurricane Net web site at http://www.voipwx.net for more information..
..SKYWARN Self-Activation will monitor any increase of winds and the coastal flood potential for Tuesday Evening and now through Wednesday Morning. SKYWARN Activation with Ops at NWS Taunton are possible to likely but may not commence until Wednesday Afternoon. Shortened coordination messages will be sent updating the SKYWARN Activation status since the winds may occur over a prolonged basis.. 1.) The size of Jose has expanded and will continue to expand as he moves up the coast and he may start a transition into a post-tropical system which may allow wind fields to expand further including on the west side of the system. 2.) The gradient between high pressure in Canada and Tropical Storm Jose may be a contributing factor to the strong winds over Southeast New England and could allow for some strong winds in other parts of the area north of Eastern New England depending on the track, strength and structure of Jose along with minor coastal flooding along the north shore of Massachusetts. This will likely be the last complete coordination message unless a significant upgrade to the situation occurs. Shortened coordination messages will be issued on SKYWARN Activation status Wednesday into Thursday as we shift into operations mode. ..Confidence continues in tropical storm impacts to portions of Southern New England similar to that of a nor’easter or strong nor’easter type of storm..
..A Tropical Storm Warning remains in effect from Hull Massachusetts to Westerly Rhode Island and includes all of Cape Cod and the Islands including Block Island, Southern Bristol, Southern and Eastern Plymouth Counties of Massachusetts and Newport and Washington Counties of Rhode Island for sustained winds of 20-40 MPH with wind gusts in the 45-60 MPH range with isolated higher wind gusts possible and 2-5″ of rain likely. These winds could cause isolated to scattered pockets of tree and wire damage and isolated power outages as well as urban and poor drainage flooding from heavy rainfall along with minor to moderate coastal flooding and the potential for significant beach erosion..
..A Flash Flood Watch is now in effect for Barnstable and Nantucket Counties of Massachusetts from Tuesday Evening through Wednesday Afternoon for 2-5″ of rain with isolated higher amounts.. ..Interests elsewhere in Southern New England just to the north and west of the current Tropical Storm Warning area should closely monitor the progress of Jose as he may bring wind gusts in the 30-40 MPH range and some rainfall which may cause isolated pockets of tree and wire damage across as well as minor coastal flooding issues in coastal areas north of the Tropical Storm Warning. Wind and Coastal flood headlines are possible for these areas in future updates..
..A High Surf Advisory is now in effect for Eastern Essex County Massachusetts through 2 AM Thursday for southerly swell, high surf and rip currents at area beaches from Hurricane Jose. The High Surf Advisory is no longer in effect for Southeast New England as this is covered under the Tropical Storm Warning..
..Hurricane Jose is holding steady currently but will gradually weaken in 1-2 days but has a large storm envelope and it will continue to become a larger system with an expanding rain and wind field and will continue to travel northward for the next couple of days and then turn toward the northeast and east around or just south of the 40 North/70 West benchmark later Tuesday Night and Wednesday. This slight shift south may reduce impacts in north and west parts of the Tropical Storm Warning area to frequent tropical storm force wind gusts versus sustained tropical storm force winds and reduce concerns north and west of the Tropical Storm Warning regarding winds but a slight shift closer to the benchmark would bring the winds further north and west. No major changes to impacts over Cape Cod and the Islands..
..VoIP Hurricane Net and Hurricane Watch Net management are monitoring the progress of both Jose and Maria. These hurricane nets activated for Maria last night for her impact on the Caribbean islands and will activate later Tuesday Night through Wednesday for Puerto Rico and the US Virgin Islands and will continue to monitor the progress of Jose. Check out the Hurricane Watch Net web site at http://www.hwn.org and the VoIP Hurricane Net web site at http://www.voipwx.net for more information..
..SKYWARN Self-Activation will monitor any increase of winds and the coastal flood potential for Tuesday Evening. SKYWARN Activation with Ops at NWS Taunton are likely starting around 6 AM Wednesday Morning into Wednesday Night with direct impacts in the tropical storm warning area similar to a nor’easter or strong nor’easter type system likely.. 2.) The gradient between high pressure in Canada and Hurricane Jose may be a contributing factor to the strong winds over Southeast New England and could allow for some strong winds in other parts of the area north of Eastern New England depending on the track, strength and structure of Jose along with minor coastal flooding along the north shore of Massachusetts. The next coordination message will be posted by 1130 PM Tuesday Evening pending further computer model data on the track of Jose and significant updates to Jose’s status as a tropical system from an intensity perspective and any changes to watches/warnings/advisories for the region. ..Confidence has grown further in tropical storm impacts to portions of Southern New England similar to that of a nor’easter or strong nor’easter type of storm..
..A Tropical Storm Warning is now in effect from Hull Massachusetts to Westerly Rhode Island and includes all of Cape Cod and the Islands including Block Island, Southern Bristol, Southern and Eastern Plymouth Counties of Massachusetts and Newport and Washington Counties of Rhode Island for sustained winds of 20-40 MPH with wind gusts in the 45-60 MPH range with isolated higher wind gusts possible and 2-5″ of rain likely. These winds could cause isolated to scattered pockets of tree and wire damage and isolated power outages as well as urban and poor drainage flooding from heavy rainfall along with minor to moderate coastal flooding and the potential for significant beach erosion. ..Interests elsewhere in Southern New England should closely monitor the progress of Jose as he may bring wind gusts in the 30-40 MPH range and some rainfall which may cause isolated pockets of tree and wire damage across areas north and west of the current Tropical Storm Warning as well as minor coastal flooding issues in coastal areas north of the Tropical Storm Warning..
..A High Surf Advisory remains in effect through 800 PM Monday for Southern Rhode Island including Block Island, Southern Bristol County, Martha’s Vineyard and Nantucket Islands for southerly swell, high surf and rip currents at area beaches from Hurricane Jose. This advisory will likely be extended over the next few days in both time and areal coverage as Jose approaches Southern New England..
..Hurricane Jose is gradually weakening but has a large storm envelope and it will continue to become a larger system with an expanding rain and wind field and will continue to travel northward for the next couple of days and then turn toward the northeast and east around the 40 North/70 West benchmark later Tuesday Night and Wednesday..
..VoIP Hurricane Net and Hurricane Watch Net management are monitoring the progress of both Jose and Maria. These hurricane nets have now activated for Maria and her impact on the Caribbean islands Monday Afternoon through Wednesday and will continue to monitor the progress of Jose. Check out the Hurricane Watch Net web site at http://www.hwn.org and the VoIP Hurricane Net web site at http://www.voipwx.net for more information..
..SKYWARN Activation with Ops at NWS Taunton are likely some time late Tuesday into Wednesday Night with direct impacts in the tropical storm warning area similar to a nor’easter or strong nor’easter type system now likely.. The next coordination message will be posted either by 1130 PM Monday Evening or 900 AM Tuesday Morning pending further computer model data on the track of Jose and significant updates to Jose’s status as a tropical system from an intensity perspective and any changes to watches/warnings/advisories for the region. ..Confidence growing in tropical storm impacts to portions of Southern New England similar to that of a nor’easter or strong nor’easter type of storm..
..A Tropical Storm Watch is now in effect from Plymouth Massachusetts to Westerly Rhode Island and includes all of Cape Cod and the Islands including Block Island, Southern Bristol, Southern and Eastern Plymouth Counties of Massachusetts and Newport and Washington Counties of Rhode Island for sustained winds of 30-40 MPH with wind gusts in the 45-55 MPH range with isolated higher wind gusts likely with 2-5″ of rain likely. These winds could cause isolated to scattered pockets of tree and wire damage and isolated power outages as well as urban and poor drainage flooding from heavy rainfall along with minor to moderate coastal flooding and the potential for significant beach erosion. Interests elsewhere in Southern New England should closely monitor the progress of Jose..
..A High Surf Advisory is now in effect through 800 PM Monday for Southern Rhode Island including Block Island, Southern Bristol County, Martha’s Vineyard and Nantucket Islands for southerly swell, high surf and rip currents at area beaches from Hurricane Jose. This advisory will likely be extended over the next few days in both time and areal coverage as Jose approaches Southern New England..
..Hurricane Jose has gradually intensified and will either intensify slightly more or hold its intensity for another day or so before it gradually weakens. During this entire timeframe, however, Jose is expected to become a larger system with an expanding rain and wind field and will continue to travel northward for the next couple of days and then turn toward the northeast and east around or just north of 40 North latitude later Tuesday Night and Wednesday..
..VoIP Hurricane Net and Hurricane Watch Net management are monitoring the progress of both Jose and Maria. Since Jose is not near land, they are not active at this time. These hurricane nets will be activating for Maria and her impact on the Caribbean islands Monday Afternoon through Wednesday and will continue to monitor the progress of Jose..
..SKYWARN Activation with Ops at NWS Taunton are possible to likely some time late Tuesday into Wednesday Night presuming direct impacts of some kind into Southern New England occur and the most likely scenario at this time is tropical storm force conditions in Southeast New England though there remains a bit of uncertainty with track and the wind field and if it will extend further into Southern New England.. 1.) Jose has strengthened a bit over the weekend and then will gradually weaken as it moves up to New England. Models are varying the speed of Jose on his closest approach to the region. This will effect ultimate direct impacts on weather in Southern New England in the late Tuesday to Wednesday timeframe presuming a close enough track to affect portions of Southern New England as currently indicated. 2.) The size of Jose has expanded and will continue to expand as he moves up the coast and he may start a transition into a post-tropical system which may allow wind fields to expand further including on the west side of the system. 3.) The gradient between high pressure in Canada and Hurricane Jose may be a contributing factor to the strong winds over Southeast New England and could allow for some strong winds in other parts of the area north of Eastern New England depending on the track, strength and structure of Hurricane Jose. The next coordination message will be posted by 900 AM Monday Morning pending further computer model data on the track of Jose and significant updates to Jose’s status as a tropical system from an intensity perspective. ..Hurricane Jose is expected to continue to at least gradually intensify or become a larger system and he is now moving more northward at this time. This northward motion is expected to continue over the next three days parallel to the US East Coast followed by a northeast and possibly eastward motion in 3-5 days. As the wind field expands, the possibility of direct impacts remain in Southern New England in the late Tuesday to Wednesday Night timeframe. Latest National Hurricane Center (NHC) advisory mentions interests from North Carolina northward to New England should monitor the progress of Jose with Tropical Storm Watches potentially posted for parts of this area in the next day or two..
..A High Surf Advisory is now in effect from 700 AM to 800 PM Sunday for Southern Rhode Island including Block Island, Southern Bristol County, Martha’s Vineyard and Nantucket Islands for southerly swell, high surf and rip currents at area beaches from Hurricane Jose. This advisory will likely be extended over the next few days in both time and areal coverage as Jose approaches Southern New England.. ..The extent on specifics of other direct impacts besides swells and rip currents along the New England Coast remain uncertain but heavy rain, strong winds, Coastal Flooding and Beach Erosion along the South Coast of New England are possible and the most likely scenario at this time understanding uncertainty remains is the potential for tropical storm force conditions for Southeast New England especially for Cape Cod and the Islands..
..VoIP Hurricane Net and Hurricane Watch Net management are monitoring the progress of Jose. Since Jose is not near land, they are not active at this time. As an aside, these hurricane nets may need to activate for Maria and her impact on the Caribbean islands Monday Evening through Wednesday.. ..Interests in Southern New England should continue to monitor the progress of Hurricane Jose. This message’s intent, at this very early stage, is to have folks continue the monitoring process. SKYWARN Activation with Ops at NWS Taunton are possible some time late Tuesday into Wednesday Night presuming direct impacts of some kind into Southern New England occur and the most likely scenario at this time is tropical storm force conditions in Southeast New England particularly Cape Cod and the Islands though there remains uncertainty with track and the wind field into this region.. 1.) Jose will strengthen a bit over the weekend and then gradually weaken as it moves up to New England. Models are varying the speed of Jose on his closest approach to the region. This will effect ultimate direct impacts on weather in Southern New England in the Tuesday to Wednesday timeframe presuming a close enough track to affect portions of Southern New England. 2.) The size of Jose will expand as he moves up the coast and he may start a transition into a post-tropical system which may allow wind fields to expand further including on the west side of the system. It is noted from the 500 PM EDT Saturday 9/16/17 advisory that the wind field is expanding. 3.) The gradient between high pressure in Canada and Hurricane Jose may be a contributing factor to the strong winds over Southeast New England and could allow for some strong winds in other parts of the area north of Southeast New England depending on the track, strength and structure of Hurricane Jose. The next coordination message will likely be posted some time Sunday pending further computer model data on the track of Jose and significant updates to Jose’s status as a tropical system from an intensity perspective. ..Jose Regains Hurricane Status as of 500 PM EDT – Friday September 15th, 2017..
..Hurricane Jose is expected to continue to at least gradually intensify and he is now on the move to the Northwest at 10 MPH. It is expected to gradually turn North-Northwestward and Northward over the next few days and continue to move parallel to the US East Coast with the possibility of direct impacts in Southern New England in the Tuesday to Wednesday timeframe. Latest National Hurricane Center (NHC) advisory mentions interests from North Carolina northward to New England should monitor the progress of Jose.. ..The extent on specifics of impact are too early to state at this time but swells and rip currents along the New England Coast are likely. Heavy Rain, Gusty Winds, and Coastal Flooding and Beach Erosion along the South Coast of New England are potential threats..
..VoIP Hurricane Net and Hurricane Watch Net management are monitoring the progress of Jose. Since it is not near land, they are not active at this time.. ..Interests in Southern New England should begin monitoring the progress of Hurricane Jose. This message’s intent, at this very early stage, is to have folks begin the monitoring process. SKYWARN Activation with Ops at NWS Taunton are possible some time Tuesday into Wednesday presuming direct impacts of some kind into Southern New England occur.. 2.) The size of Jose will expand as he moves up the coast and he may start a transition into a post-tropical system which may allow wind fields to expand further including on the west side of the system. The next coordination message will likely be posted some time Saturday pending further computer model data on the track of Jose and significant updates to Jose’s status as a tropical system from an intensity perspective. ..Tropical Storm Jose is expected to at least gradually intensify and after making a cyclonic loop 400 miles east-northeast of the southeastern Bahamas, it will gradually move west and northwestward and then nothward parallel to the US East Coast with the possibility of direct impacts in Southern New England in the Tuesday to Wednesday timeframe. Latest National Hurricane Center (NHC) advisory mentions interests from North Carolina northward to New England on the US East Coast should monitor the progress of Jose.. ..Interests in Southern New England should begin monitoring the progress of Tropical Storm Jose. This message’s intent, at this very early stage, is to have folks begin the monitoring process.. Tropical Storm Jose is currently a 70 MPH tropical storm making a cyclonic loop to the east-northeast of the Bahamas. Over the next few days, Jose is expected to track more towards the northwest and northward with some increase in forward speed and should at least gradually intensify. Model guidance has shifted a bit closer to the coast with some reliable guidance bringing Jose to near the 40 North/70 west benchmark just south of Nantucket. Other models are further west while others are still further east and there is considerable spread in the guidance. The NHC advisory mentions interests from North Carolina to New England should monitor the progress of Jose so that necessitates starting coordination messages. Given the spread in the model guidance, it is too early to state any direct impacts with the exception of swells and rip currents along the New England coast which are likely as we get into the weekend and early next week. Heavy Rains, Gusty Winds, and Coastal Flooding to South Coastal New England are all potential threats pending the track of Jose if a closer to the coast impact verifies Tuesday into Wednesday. The track error ‘cone of uncertainty’ is approaching Southern New England with the latest forecast package. The next coordination message will likely be posted some time Friday Evening pending further computer model data on the track of Jose and significant updates to Jose’s status as a tropical system from an intensity perspective. ..Isolated to Scattered Strong to Severe Thunderstorms are possible across Eastern Massachusetts and Rhode Island and possibly into Eastern Connecticut today through late afternoon. Strong to damaging winds, hail, frequent lightning and urban and poor drainage flooding to flash flooding are the main threats. The Storm Prediction Center (SPC) has placed the region in a marginal risk for severe weather..
..A Flash Flood Watch is in effect through late tonight from Worcester County through Rhode Island and Eastern Massachusetts west of the Cape Cod Canal for thunderstorms causing urban/poor drainage flooding to flash flooding in localized areas..
..SKYWARN Self-Activation will monitor the severe weather and flash flood potential for today into tonight. Below is the NWS Taunton Flash Flood Watch Statement, Experimental Enhanced Hazardous Weather Outlook, Hazardous Weather Outlook and SPC Day-1 Convective Outlook..